Christian legalism is a false teaching. Islamic legalism is a celebrated reoccurring theme in the Qur'an. In the following passages, you will notice the direct connection between a man's good works and Allah's rewards. The Muslim holy book plainly teaches that, if one works hard enough, he can earn himself a place of favor in Allah's presence. Notice these passages and ask yourself, what type of world will it be if a majority of Muslims ever return to a faithful obedience of the Qur'an? Qur'an 9:120-121 "God will not deny the righteous their reward. Each sum they give, be it small or large, and each valley they traverse, shall be noted down, so that God may requite them for their noblest deeds." Qur'an 11:114 "Attend to your prayers morning and evening, and in the night-time too. Good deeds shall make amends for sins. This is an admonition for thoughtful men. Therefore have patience; God will not deny the righteous their reward." Qur'an 16:96 "We shall recompense the steadfast according to their noblest deeds." For the Muslim, it seems that earning Allah's favor is the labor of man's life. For Christians, however, salvation does not depend upon self-obtained goodness, but upon honest submission to a loving Savior. The legalism of the Old Law was powerless to save and it certainly does not lead to salvation under the New Law either. Jesus once said, "If you love me, you will obey what I command." (John 14:15, NIV) In other words, followers of Christ obey in order to offer Him a heart filled with love, not to present Him with a check-off list of completed duties. Mature Christians know that obedience is born out of love for Christ not legalistic servitude. Christian legalism is a false teaching. Islamic legalism is a celebrated reoccurring theme in the Qur'an. Is your Christian journey a painful struggle of "have to's" or is it a life fulfilling relationship of "want to's"? If your walk is filled with drudgery and your path seems almost too steep to climb, it might be because you have bought into the same demonic line that Islam is teaching its followers. Unlike the Qur'an which describes a bargain you strike with Allah, the Bible describes a free gift that was purchased by Jehovah's Son. In Colossians 2:9-12 (NIV), there is a marvelous passage about the Deity of Jesus and the fullness that comes to those who accept Him as Lord. "For in Christ all the fullness of the Deity lives in bodily form, and you have been given fullness in Christ, who is the head over every power and authority. In him you were also circumcised, in the putting off of the sinful nature, not with a circumcision done by the hands of men but with the circumcision done by Christ, having been buried with him in baptism and raised with him through your faith in the power of God, who raised him from the dead." Did you get that? Not only does the fullness of God dwell within Jesus, those who have experienced spiritual circumcision through baptism are given "fullness in Christ". What could possibly happen during baptism that could provide such a "fullness"? Notice the words of Peter in Acts 2:38 "Repent and be baptized, every one of you, in the name of Jesus Christ for the forgiveness of our sins. And you will receive the gift of the Holy Spirit." At baptism Jesus circumcises the heart and fills us with the Spirit who is from God. Through Christ He secures our salvation. You cannot save yourself. Check-off lists will not work. The first step toward a relationship with the one true God, Jehovah, is an honest assessment of who you are and how desperately inadequate you are to save yourself. Serve Him because you love Him. Submit to Him because you trust Him. Give Him a heart full of convicted appreciation not a list of self-righteous works of merit. Unlike Allah, your God knew that you needed a Savior. He sent His only begotten Son into this world to become one of us, to suffer and die at our hands and thereby pay our sin debt for us. Love the Son and you will be honored by the Father. Reject the Son and you will most certainly feel the Father's wrath. Let the Son save you. Qur'an quotations are taken from N.J. Dawood's translation. 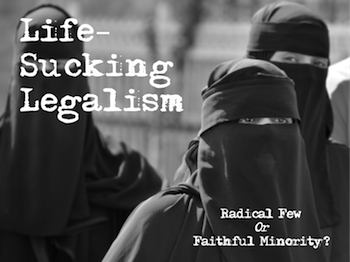 Back to Top of "Life-Sucking Legalism"